The resort has two upscale restaurants right on-site. Go for a swim in the saltwater pool while the little ones splash in the children’s pool. Kids will have fun playing mini golf when not splashing in the pool. Kids will love hanging out in the children's club, playing on the playground and splashing in the children's pool. 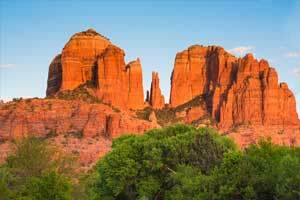 Take a family field trip to Red Rock State Park, it's a 30 minute drive from the resort. The outdoor salt water pool is heated so go ahead and hop right in. Gather the family on the private patio and watch the sunset. - The above list may not be comprehensive. Fees and deposits may not include tax and are subject to change.